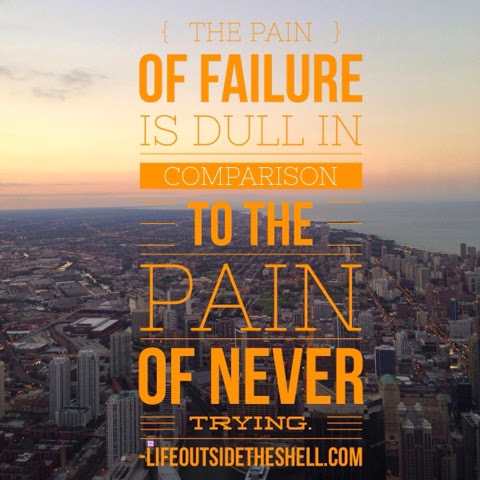 Life Outside the Shell: What if I fail? Failure...we all experience it and we all hate it. Did you know polls have shown that people are more afraid of public speaking than they are of death? The reason is simple, we get paralyzed by the fear of failure. I have failed so many times in my life that if I wrote on every failure I have experienced I could have a blog post for the next year(and then some)! The number one comment I hear from people when I encourage them to try something "outside of their shell" is "But what if I fail?". We have all felt the pain of failure. In my past, if I tried something I just knew was going to be great and it totally bombed I made a vow to never try anything new again. One area I was very successful in was not trying. It was great for a while because I didn't experience any discomfort, embarrassment, nerves or people watching me as I tried. But as time passed I began to notice that life was passing me by. People all around me were getting promotions, making friends, growing in their relationship with the Lord, getting opportunities to go places and do amazing things. I remember sharing with the Lord how I wanted those opportunities and His response was simple....then GO. He reminded me of Moses and though he was nervous and felt completely incapable he WENT. 1. Failure reveals your character. As I began to try new things, though they were small things at first, I noticed how sour my attitude was when I failed. The Lord used my failures to bring things to the surface that needed to be dealt with and refined. I would never trade all my failures for the kind of character that the Lord has developed in me from those failures. I know this is not the news we want to hear right after we have failed(it's quite irritating, in fact) but it is so true. Side note: be slow to "encourage" someone with this nugget or you might get sucker punched. :) Often times God does His best work when we step back and let Him do His thing in other people's hearts and lives. 2. Failure brings you back to the heart of God. Have you ever noticed it's when "things" aren't lining up in our life that we really begin to pray and search God's word for answers? I've found that I rarely get the answer I thought I was looking for but instead God shows me who I am in Him. Until we find our identity in Him everything will appear to be a failure in our lives. 3. 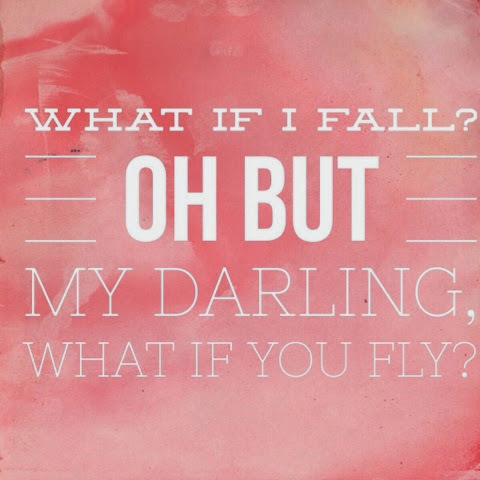 Failure makes you fly. I remember when I was young I hated math. I avoided it at all cost. However, when I was in 8th grade I moved schools and the math classes there were even harder. So hard that I was going to flunk if I didn't study. So my genius older sister, Becky, began to tutor me everyday after school. The result was that I got so good at math that when I went into high school I took many college courses and was able to clep out of math classes in college. I even won medals at state on the Math team(yes I know, nerd alert)! 4. Failure is better than not trying. At some point we have to decide that we would rather live life failing from time to time then to die with regrets of not trying those things God puts in front of us. I have lived on both sides of the coin and I can promise you the pain of failure is dull in comparison to the pain of not trying! Do you have an idea or a dream you want to pursue? No matter how big or small that dream is God wants you to fly. Just like a baby bird leaving the nest, you may fail first, but you will eventually fly.